In November of 2004, Bob Sheets, Whit Haydn, and Chef Anton combined their original methods for the ancient swindle, the Shell Game, and taught this new system to the School for Scoundrels class at The Magic Castle. This is far more than an introduction to a whole new way of looking at the shell game, and a new system for performing the game that is rock solid, unassailable, and easy to learn. 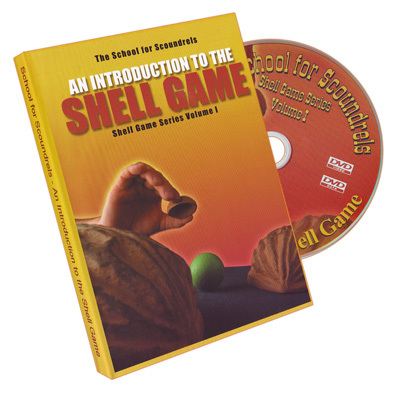 In this, the first installment of a series of DVD's on the shell game, the beginning student is taught an entertaining beginning routine with patter, the basic moves and approaches to the game that make up the system, and given everything necessary to move from a complete beginner to an intermediary proficiency in the shell game. These lessons are not just a rehash of what has been published before, but new moves, ruses, and strategies that will change the way the game is played far into the future. Intro to the Shell Game: Volume One by Bob Sheets and Whit Hadyn In November of 2004, Bob Sheets, Whit Haydn, and Chef Anton combined their original methods for the ancient swindle, the Shell Game, and taught this new system to the School for Scoundrels class at The Magic Castle.